There were only 2 rounds played so far and it's still very beginning of the Regular Season in Higher League. Here is the last round review presented by ESL. An exciting game was played in Pavlodar. Irtysh faced Bars. Host Irtysh (2-0) defeated guests from Petropavlovsk (0-2) 87-77. Irtysh is looking forward to face Aktobe on the road in the next round and it will be for sure the game of the week. Bars will play against Kazygurt and it may be a tough game between close rivals. The game in Alma-Ata supposed to be also worth to mention about. Aktobe (2-0) played at the court of SDYUSH (0-2). Aktobe smashed SDYUSH 99-68. Aktobe will play against Irtysh in Pavlodar in the next round and it will be for sure the game of the week. SDYUSH will play on the road against Tigers Ast. in Astana and it may be a tough game between close rivals. In the last game of round 2 winless Tigers Ast. lost to undefeated Kazygurt in Shymkent 59-85. There was no surprise in Shymkent where Tigers Ast. (0-2) was crushed by Kazygurt (2-0) 85-59. Kazygurt will play against Bars (#4) in Petropavlovsk in the next round. Tigers Ast. will play at home against SDYUSH and it may be a tough game between close rivals. There are only two more rounds left in the Regular Season in National League. Coincidentally all hosts won their games. Here is the last round review presented by ESL. Third ranked Almat.Legion (22-12) crushed at home 5th ranked Sinegorie K. (10-23) by 31 points 86-55, which is the biggest margin this round on Wednesday night. Newly promoted Almat.Legion maintains third place with 22-12 record having four points less than leader Astana. Sinegorie K. lost third consecutive game. Sinegorie K. at the other side, also newcomer in the league, keeps the fifth position with 23 games lost. Both teams do not play next round, which will be an opportunity for some rest. There were no shocking results in the rest of the games of round 21: bottom-ranked Kaspiy Aktau lost to Tobol on the opponent's court 97-115. Tobol outscored Kaspiy Aktau in a home game 117-92. Sinegorie K. recorded a loss to Almat.Legion on the road 88-84. Rather expected game in Kostanay where 7th ranked Kaspiy Aktau (4-29) was defeated by fourth ranked Tobol (19-12) 115-97 on Wednesday. Tobol maintains fourth place with 19-12 record. Kaspiy Aktau at the other side stay dead last with 29 lost games. Tobol are looking forward to face league's leader Astana on the road in the next round and it will be quite challenging to get another victory. Kaspiy Aktau will play against the league's second-placed Barsy Atyrau (#2) and is hoping to prove to their supporters that this time they can win. Rather predictable result in Kostanay where fourth ranked Tobol (19-12) smashed bottom-ranked Kaspiy Aktau (4-29) 117-92 on Thursday. Tobol maintains fourth place with 19-12 record. Kaspiy Aktau at the other side stay dead last with 29 lost games. Tobol are looking forward to face league's leader Astana on the road in the next round and it will be quite challenging to get another victory. Kaspiy Aktau will play against the league's second-placed Barsy Atyrau (#2) and is hoping to prove to their supporters that this time they can win. Not a big story in a game in Alma-Ata where 5th ranked Sinegorie K. (10-23) was defeated by third ranked Almat.Legion (22-12) 88-84 on Thursday. Newly promoted Almat.Legion maintains third place with 22-12 record having four points less than leader Astana. Sinegorie K. lost third consecutive game. Sinegorie K. at the other side, also newcomer in the league, keeps the fifth position with 23 games lost. Both teams do not play next round, which will be an opportunity for some rest. The games are now more important than at the beginning of the Regular Season. We may still expect few shocking results in upcoming 3 rounds. Coincidentally all hosts won their games. Here is the last round review presented by ESL. The most interesting game was a derby match between two local teams from Atyrau: Barsy Atyrau (#2) and Barsy 2 (#6). Barsy Atyrau (23-9) smashed visiting Barsy 2 (5-28) by 16 points 70-54. Barsy Atyrau have an impressive 12-game winning streak. They maintain second position with 23-9 record having five points less than leader Astana. Barsy 2 lost tenth consecutive game. Newly promoted team keeps the sixth place with 28 games lost. Both teams do not play next round, which will be an opportunity for some rest. Another interesting game was again a derby between two teams from Atyrau: Barsy Atyrau (#2) and Barsy 2 (#6). Barsy Atyrau (23-9) smashed visiting Barsy 2 (5-28) by 35 points 87-52. Barsy Atyrau have an impressive 12-game winning streak. They maintain second position with 23-9 record having five points less than leader Astana. Barsy 2 lost tenth consecutive game. Newly promoted team keeps the sixth place with 28 games lost. Both teams do not play next round, which will be an opportunity for some rest. Bottom-ranked Kaspiy Aktau managed to get the second consecutive victory on Friday night. This time they outleveled sixth-ranked Barsy 2 104-79. 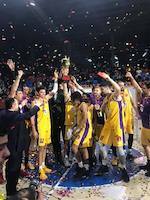 It's especially surprising that the victory came too easily and 25-point difference proves that Kaspiy Aktau was well-prepared to that game. Kaspiy Aktau maintains seventh position with 4-27 record. Barsy 2 lost tenth consecutive game. Newly promoted team keeps the sixth place with 28 games lost. Kaspiy Aktau will meet higher ranked Tobol (#4) in the next round and it may be quite challenging game. Barsy 2 will have a break next round. The game in Aktau supposed to be also worth to mention about. 6th ranked Barsy 2 (5-28) played at the court of seventh ranked Kaspiy Aktau (4-27). Kaspiy Aktau smashed Barsy 2 99-77. Kaspiy Aktau maintains seventh position with 4-27 record. Barsy 2 lost tenth consecutive game. Newly promoted team keeps the sixth place with 28 games lost. Kaspiy Aktau's next round opponent will be higher ranked Tobol (#4) in Kostanay and it may be quite challenging game. Second ranked Barsy Atyrau (23-9) crushed at home 5th ranked Sinegorie K. (10-21) by 45 points 106-61, which is the biggest margin this round on Monday night. It ended at the same time the two-game winning streak of Sinegorie K.. Barsy Atyrau have an impressive 12-game winning streak. They maintain second position with 23-9 record having five points less than leader Astana. Newly promoted Sinegorie K. keeps the fifth place with 21 games lost. Barsy Atyrau will have a break next round. Sinegorie K. will play on the road against Almat.Legion (#3) in Alma-Ata and it may be a tough game between close rivals. In the last game of round 20 Sinegorie K. was destroyed by Barsy Atyrau on the opponent's court 91-66. Rather expected game when 5th ranked Sinegorie K. (10-21) was crushed on the road by second ranked Barsy Atyrau (23-9) 91-66 on Sunday. Barsy Atyrau have an impressive 12-game winning streak. They maintain second position with 23-9 record having five points less than leader Astana. Newly promoted Sinegorie K. keeps the fifth place with 21 games lost. Barsy Atyrau will have a break next round. Sinegorie K. will play on the road against Almat.Legion (#3) in Alma-Ata and it may be a tough game between close rivals. 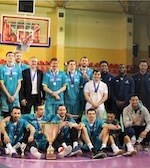 Astana sealed Cup title in Kazakhstan winning all the games of the tournament. In the last game they edged Almaty Legion 84-62. The 7th time holders grabbed an early 19-11 lead and never looked behind. Moreover they posted a 15-6 surge before the halftime and nailed 33 points in the third quarter. Aleksandr Zhigulin (205-F-94) top-scored for the winners with 18 points, while Dmitriy Gavrilov (204-F-86) notched 13. Fadeykin replied with 15 points in a loss and Vadim Korzhov (178-PG-97) netted 14.